Trans Adriatic Pipeline AG (TAP AG) commenced the formal land exit process of the temporary leased land for the construction of the Trans Adriatic pipeline (TAP) in June 2017. A small ceremony was held on 29 June with some of landowners to mark this key milestone. To date, more than 420 parcels have been returned to the landowners and land exit agreements have been signed. 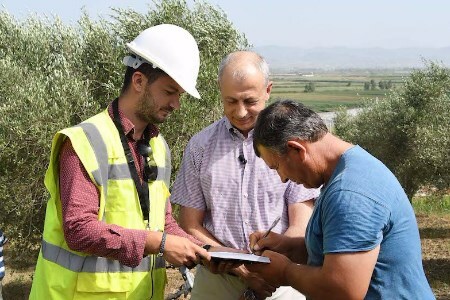 "Land exit process begins in Albania for TAP pipeline"
The process of land exit and the return of the land to the owners commenced in Fier (Albania) immediately after construction works for some of the pipeline sections in this region were completed. Before the land was returned to the respective landowners, it was reinstated to its previous condition. Currently, several landowners and land users have already started planting, in line with the normal agricultural cycle, in accordance with TAP AG safety requirement. The land easement and servitude process was implemented in accordance with the international standards of the European Bank for Reconstruction and Development (EBRD). TAP AG has compensated landowners and land users for leasing the land and for the crop loss for a period of two years, whereas in many cases the land has been handed over in less than one year. Temporarily leased land for the pipeline construction corridor is approximately 8170 ha. Permanently acquired land for the eight block valve stations, the landfall into the sea, one compressor station, and one measuring station is 70 ha. A total of approximately 10 585 land plots are impacted in total in Albania: approximately 2984 parcels are impacted by access roads and bridges; and approximately 7601 parcels are impacted by the right-of-way, the pipeline, the compressor stations and other aboveground installations.